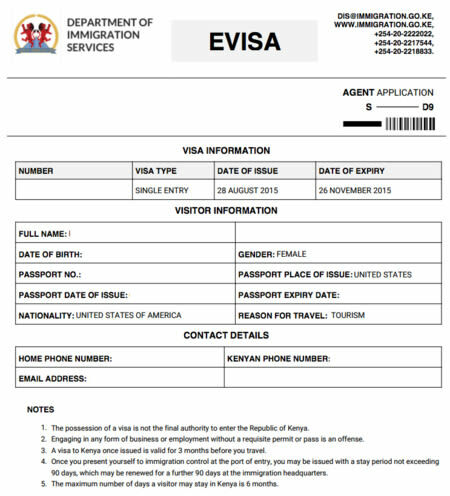 On September 1, 2015, the Department of Immigration Services in Kenya launched an e-Visa which allows visitors to apply for a visa online without having to visit a Kenyan diplomatic mission. This e-Visa is an authorization document issued in PDF format that allows visitors to travel to a Kenyan entry point. Applicants will receive their visas via email, after filling the application form with the necessary information and once the online credit card payment is completed. Travelers who apply for a Tourist e-Visa must have a passport that is valid for at least six months from the planned date of entry. The Kenya e-Visa is valid for 3 months from the issue date. Once you present yourself to immigration control at the port of entry, you may be issued with a stay period not exceeding 90 days for 1 single entry, which may be renewed for a further 90 days at the immigration headquarters. Each adult visitor to the Republic of Kenya is required to submit an e-Visa application. Engaging in any form of business or employment without a required permit or pass is not permitted. Holders of travel documents (NOT A NATIONAL PASSPORT) should not make e-Visa applications, they should apply to the director of immigration services through the nearest Kenya mission. Please note that a visa is required prior to entry into Kenya. NOTE: The possession of a visa is not the final authority to enter the Republic of Kenya. What is the Kenyan e-Visa? This e-Visa is an authorization document that allows visitors to travel to a Kenyan entry point. What do I need to apply for a Kenya e-Visa? The standard processing time is 5 business days. How long is my Kenya e-visa valid for? Kenia e-visa is valid for 90 days from the date of issue. An extension may be obtained by visiting NPRA once you are inside Kenya. What conditions must the applicant’s passport meet to get a Kenya e-Visa? Applicant’s passport should have at least 6-months validity from the time of entry into Kenya and at least one blank page. When will my Kenya e-Visa expire? Once issued, an e-Visa to Kenya is valid for 3 months before you travel. Once you present yourself to immigration control at the port of entry, you may be issued with a stay period not exceeding 90 days, which may be renewed for a further 90 days at the immigration headquarters. The maximum number of days a visitor may stay in Kenya is 90. How do I apply for the Kenya e-visa? Fill in a simple online form (You need a scanned copy of your passport, digital photo to upload and proof of travel, such as a flight ticket). Complete the online payment with a Credit Card/Paypal. Check your application online after applying for a Visa. Our online application is a quick Kenya visa application form to obtain your e-Visa within 72 hours. Can I travel before I receive my Kenyan visa? Yes, we will send you your payment invoice, which can be used to travel even if you don't have your e-Visa on hand. At times the system becomes congested due to high volumes of applications, and this can cause some applications to be excluded in the batch approvals. When this happens, the approval will no longer be generated. The travelers will have to print copies of the visa payment invoice and use the printed copy to board the plane and for visa issuance upon arrival in Kenya. The airlines are aware of this, so the travelers will have no problem entering the country. Are any vaccinations required to visit Kenya? What else do I need to travel to Kenya? Kenya requires visitors to have a travel document/passport that is valid for at least 6 months from the date you enter the country. Depending on your nationality, there may be additional requirements beyond the Kenya visa requirements. Do I need to carry my Kenya e-Visa with me? All foreign citizens wishing to travel to Kenya will need an e-Visa, except citizens from countries who are exempt. If you are in Kenya and wish to extend your stay, you may apply for an extension at the immigration headquarters in Nairobi. Note that the maximum number of days a visitor may stay in Kenya is 6 months. Is my Kenya e-Visa valid for a single entry or multiple entries? It is valid for a SINGLE (one) entry only. Single Entry visa Issued for single entry to people whose nationalities require a visa to enter Kenya either for business, tourism or medical reasons. Transit visa Issued to people connecting through Kenya to other destinations for a period not exceeding 72 hours. Those catching connecting flights without leaving the airport do not need to apply for transit visas. I have already visited Kenya once using my single entry visa, do I need to apply for another e-Visa? Yes, when your visa is used or expired you need to apply for another one in order to travel to Kenya again. What are the reasons for travel accepted to apply for an e-Visa? They are tourism, business, education, employment, medical, religion, settlement/family and "other". No. Unfortunately, if you make a mistake the e-visa is INVALID and you will need to apply a new one. If you do notice a mistake on your application, please contact us ASAP. Albania, Algeria, Andorra, Angola, Antigua and Barbuda, Argentina, Australia (Australian), Austria, Bahrain, Bangladesh, Belarus, Belgium, Benin, Bhutan, Bolivia, Bosnia and Herzegovina, Brazil, Bulgaria, Burkina Faso, Cambodia, Canada (Canadian), Cape Verde, Central African Republic, Chad, Chile, China, Colombia, Comoros, Congo, Costa Rica, Cote d'Ivoire, Croatia, Cuba, Czech Republic, Denmark, Djibouti, Dominican Republic, Ecuador, Egypt, El Salvador, Equatorial Guinea, Estonia, Finland, France, Gabon, Georgia, Germany (German), Greece, Greenland, Guatemala, Guinea, Guinea-Bissau, Guyana, Haiti, Honduras, Hong Kong, Hungary, Iceland, India, Indonesia, Iran, Ireland, Israel, Italy, Japan, Jordan, Kazakhstan, Korea, Kuwait, Kyrgyzstan, Lao, Latvia, Liberia, Liechtenstein, Lithuania, Luxembourg, Macedonia, Madagascar, Malta, Marshall Islands, Mauritania, Mexico, Micronesia, Moldova, Monaco, Mongolia, Montenegro, Morocco, Mozambique, Myanmar, Nepal, Netherlands, New Zealand, Nicaragua, Norway, Oman, Pakistan, Palau, Panama, Paraguay, Peru, Philippines, Poland, Portugal, Puerto Rico, Qatar, Romania, Russia, Sao Tome and Principe, Saudi Arabia, Serbia, Slovakia, Slovenia, South Sudan, Spain, Sri Lanka, Sudan, Suriname, Sweden, Switzerland, Taiwan, Thailand, Timor-Leste, Togo, Tunisia, Turkey, Turkmenistan, Ukraine, United Arab Emirates, United Kingdom (UK Citizens) (British), United States (US Citizens), Uruguay, Uzbekistan, Venezuela, Vietnam, Yemen. Africa is a beautiful continent, and many African countries are on people’s bucket list such as Kenya. As you can imagine, most people visit African countries to go on safaris, but the scenery is not too bad either. Nonetheless, there are a few things you should probably be aware of before your departure, and most of them regard your personal safety. While Kenya is a relatively safe country, you should always be prepared to avoid trouble. Stick around to learn a few basic things that you should keep in mind if you are thinking of visiting Kenya. First of all, as mentioned above, Kenya is a pretty safe place to visit. People there are very friendly, and you will be respected as a tourist. At the same time, however, Kenya is a poor country, so petty crimes will happen if you draw too much attention to yourself. The best thing you could do is wear clothes that do not attract attention, and you should probably leave all your jewelry at home. If you have a camera or other such devices, you should keep them away from sight when you are not using them. At the same time, it is recommended that you get a money belt to keep your cash and a copy of your passport. You never know when some poor person is desperate enough to rob you. Women are also pretty safe in Kenya. Nonetheless, you should dress modestly. You do not want to catch someone’s eye without reason, so leave your jewelry and unnecessary devices at home. Also, it would probably be a good idea not to travel alone or go out alone at night. It is better to avoid such situations than getting into trouble. Another thing you should know before traveling to Kenya is that some inoculations are in order. For one, you need to get immunized against Typhoid fever, Yellow fever, and of course, Malaria. There are a few other diseases that you should protect yourself against, such as tetanus or hepatitis A, but it is best if you ask your doctor which ones you need. Perhaps you have already had a tetanus shot in the last 10 years and do not remember. The point is that there are quite a few diseases that you can get to Kenya, and if you can prevent them beforehand, that would be excellent. You do not want to ruin your vacation because you could not be bothered to get immunized, do you? When it comes to communication, you should not have any issues. In Kenya, people speak English and Swahili. They get very excited when they hear tourist saying a few words in Swahili, so learning a few formulas could help you make more friends. However, if you do not have the time, English is just fine. You will be able to communicate with people in Kenya. This is especially important when it comes to guides. There are some strict rules when it comes to safari, and you need to be clear on every single aspect. Speaking of guides, you can explore some of Kenya on your own, but if you want to see the wildlife, a tour guide is recommended. After all, this is animals we are talking about, and you may not know the proper behavior you should adopt when you encounter them. If we are talking about predators, that is even more so. It is a fact that people have die from not listening to the tour guides. Leaving the wildlife aside, we should probably cover the food and drinks. From what we can tell, the water in Kenya is okay to drink. However, if you have a sensitive stomach, you may want to go for bottled water instead. If you want to just brush your teeth, tap water is just fine. Drinking, on the other hand, should be handled with caution. As for food, Kenya is not famous for any dishes. Not that we know of, at least. Even so, people in Kenya eat a lot of grain such as couscous and rice. They add a side of fish or other meats. But what you will love is the seasoning. Kenyans know how to season their food, and surely you will find it delicious. While we are still on the subject of food, you should probably avoid street vendors. This rule applies to many countries, and Kenya makes no exception. Street vendors do not always cook their food in sanitary conditions, and it is very easy to get sick from that. However, if you see a bunch of people, locals or foreign, that they stay in line to get food from a street vendor, you could probably eat there too. Crowded lines are always a sign of tasty and healthy food. If you have the chance, you should try and learn something about the tribes in Kenya. They have some exciting stories, and if you ask your tour guide, he can take you there and see how the tribes live. You will hear a lot of interesting stories. There are only two tribes in Kenya that tourists know of. The Massai and the Samburu tribes. They lead very simple lives, but they seem to be very happy. Their way of life will make you think about how complicated your own life is. But even so, visiting one or both tribes will be an interesting experience for you. Kenya is not a rich country. Not in wealth, anyway. However, it does have some wonderful places you can see. The wildlife and the insects are something you can stare at all day long, although we recommend that you get bug repellants. The people are friendly, the tourism there is cheap, and you can have an incredible experience. If you go on safari, surely you will want to come back. Who knows? Maybe you will choose the best time to catch some of the Great Migration. It is something that you need to witness at least once in your life.